Over the past several decades, Canadian agriculture has demonstrated a remarkable capacity to improve productivity under wide ranging and seasonally fluctuating growing conditions as well as to recover from extreme events such as floods and droughts. This capacity has been supported through relatively high public sector investments (in some cases supported by the private sector) in supply chain innovation, infrastructure and extension services and insurance and disaster relief. It has also been aided by a long period of relative climate stability. Recently, however, the level of this public sector support has been reduced at the very time that it should be strengthened. Climate change now presents an unprecedented challenge to this adaptive capacity. The frequency and magnitude of extreme climate events will increasingly lie outside the range of natural variability that has been the norm, a situation known as “non-stationarity.” Floods of a magnitude that we once expected to occur once in a hundred years will occur far more frequently, while long, hot, dry summers will become the norm; some regions in Canada are already experiencing major droughts and floods in the same year. Warmer temperatures will also facilitate the spread of new pests. The resulting impacts will be increasingly complex, affecting not only food production, but also the entire food supply chain from field to table. 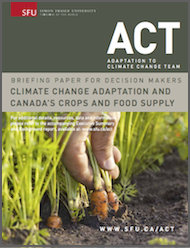 This briefing outlines the current and anticipated impacts of projected climate changes of climate change on Canadian agriculture and food security; the inter-relationship between food, water, energy and biodiversity; and proposals for adaptation measures that can capitalize on opportunities and reduce or avoid the impacts of a changing climate. Food production and security is not only critical to human health, it is also a significant economic driver essential to the well-being of communities and regions across Canada. With export sales of $40.3 billion, Canada is the world’s sixth largest exporter of agriculture and agri-food products. Primary agriculture alone accounts for some $22.2 billion dollars (or 1.7%) of Canada’s gross domestic product. In 2011 primary agriculture and food, beverage and tobacco processing directly employ more than 571,800 people (or 3.3% of the employed labour force). Moreover, the wider “food sector” (including sub-sectors such as food and beverage processing, food service, and food retail and wholesale), in which primary agriculture plays an important role, has been linked to as many as 1 in 8 jobs in Canada. Regional shifts in temperature and precipitation, which will result in long term changes to productivity and location of food production. Increased variability and extremes in floods, droughts, pest outbreaks and fires with short-term impacts on production. Below is a summary of some of the recent impacts of flooding and prolonged droughts in the Canadian Prairies and the American mid-west. In 2001-2002, droughts in the Prairie Provinces caused $3.6 billion in lost production and resulted in over 40,000 people being out of work. In 2011, floods in Manitoba’s Red River Basin caused $936 million in direct damages. Subsequent First Nation lawsuits total an additional $1.15 billion. In 2010/11, extreme precipitation during harvest of vegetables in the Fraser Valley, British Columbia resulted in $6.3 million in losses. In 2012, drought and high temperatures in the American mid-west reduced corn and maize crop production, spiking food costs worldwide and sending some UK pig farmers out of business due to the price of feed. Recent spring rains have relieved the drought in some parts but it still rated exceptional in the High Plains. In late 2012, concerns were raised about post-drought water levels making the Mississippi River impassible for barges north of St Louis, which could lead to $7 billion in lost trade and higher food prices resulting from increased rail transportation costs. The US Army Corps of Engineers was tasked with using explosives to deepen the riverbed. BC imports more than half of its food, including most of its salad vegetables from California. The availability of these foods will be affected by climate changes in those production areas.